ERNESTO MALLO is something of a revelation for the English-language reader, appearing out of nowhere like the militant that he was to ambush the unsuspecting reader going about his business. Mallo has channelled the worldly knowledge he gained as a member of the Fuerzas Armadas Revolucionarias (later absorbed by the Montoneros) into his work, crafting narrative that is eloquently blunt in the style of a playwright, yet cannily deep. 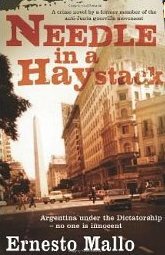 Economy can be a great virtue, and this writer wastes no time digging holes but pushes his reader forward rapidly upon the uneven, hazardous and fearful surface of Buenos Aires in the grip of the military terror. In the spirit of the playwright, Mallo maps this disconcerting landscape through characters that symbolise an Argentina that has lost its way. They are looking for bearings in a country that can provide none. The search for justice emerges as a strong theme from this tale in which the enigmatic Superintendent Lascano investigates one murder among many, picking delicately through the forgettable debris of the junta’s death squads as if only some of the victims are worthy of being championed. Through Lascano’s efforts to uphold the law in an environment where legality is merely contingent upon which side you happen to fall on, Mallo cleverly builds a set of tensions that question the nature of good and evil but also their simple attribution. Why is it important to bring a murderer to justice, when justice itself has become a justification for murder? As the packet reads: in Argentina under the dictatorship, no one is innocent. If the method by which the author delivers his dialogue – italicised paragraphs in which the spoken phrases run into each other – can be awkward, it nonetheless characterises well Mallo’s method, pushing the dialogue and action forward at a rate of knots so that we never feel comfortable and have little opportunity for complacency. We must watch actors choreographically positioned upon a stage and whose acting is uncomfortably plausible, rarely pausing for breath. Mallo is by no means the first former guerrilla to turn to fiction as a means, perhaps, of exorcising their own ghosts – others such as Pepetela in Angola, for example, come to mind – but he is certainly one of the most serious. If Needle in a Haystack was his first novel, published in 2006 when he was 58, then there is clearly a great deal more to look forward to from this writer. Jethro Soutar’s translation is faultless and packs such a punch that it undoubtedly enhances Mallo’s blunt yet also incisive style, no mean feat for a translator.